Welcome to Team Awa, Ohaeawai School. We are a collaborative learning team of Year 3 and 4 students. Our teachers are Mrs Craig and Mrs Clarke. Welcome to Team Awa's Blog. 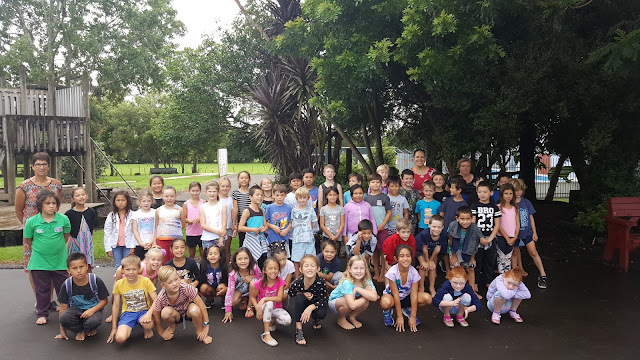 This blog is to show the learning that the Year 3 and 4 students will be doing this year. Each week two students will choose a piece of work that they have done to share on our class blog. Today we wanted to show Team Awa and the teachers who will be working in this classroom. We have two teachers Mrs Clarke and Mrs Ritchie, and a teacher aide called Bev. This year will be packed with learning new things, working together, building resilience and always using out school values both at school and at home. Looking forward to seeing all the learning, progress and fun this year from the students in Team Awa. Have a great year everyone!